Using the Etch A Sketch for drawing or doodling is exactly what the toy was designed for — and it's also what it's completely terrible at. You might as well be tying your hands behind your back when you trade a pencil for a pair of knobs, but Jonathan Odom has found a way to turn the Etch A Sketch's weaknesses into strengths with a tiny zen garden you groom with a similar pair of hand-cranked dials. 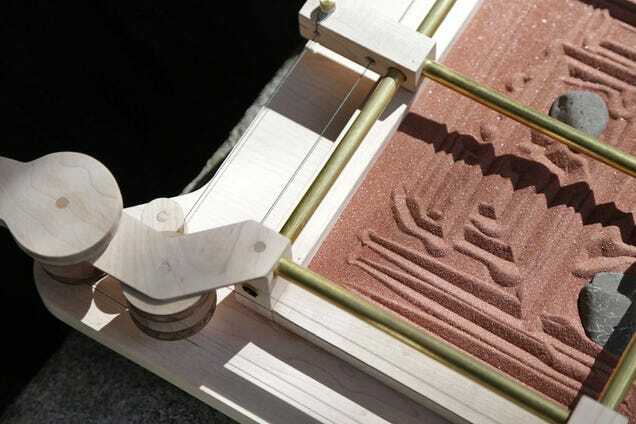 His hand-made XYZen Garden works pretty much exactly like an Etch A Sketch does, except all of the wooden pulleys and brass crossbeams needed to make it work are left exposed, which just adds to its charm. And instead of a sharp point scraping silver powder off a plastic screen, the XYZen Garden has a small tool that carves lines in a shallow bed of sand.